This is great, no compliants, however the second picture shows the choice of a Windows 7 theme with the standard grey Windows 2008 Server background and the Citrix Enhanced Desktop background. 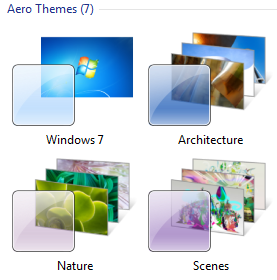 Neither of these look like the standard Windows 7 themes found on a standard Windows 7 machines. So the issue is how do I configure the same themes from Windows 7 machines into a XenApp environment. There maybe scenarios where you want to create a seamless experience across all machines, be they Windows 7 physical, VDI or XenApp? Well as per the Citrix article you still need to enable the Desktop Expereince feature and ensure the themes service is set to automatic. *Update that site above seems to have removed the zip file, so you can grab it here. This configures the standard Windows 7 theme with the blue background to launch the first time the user logs in. 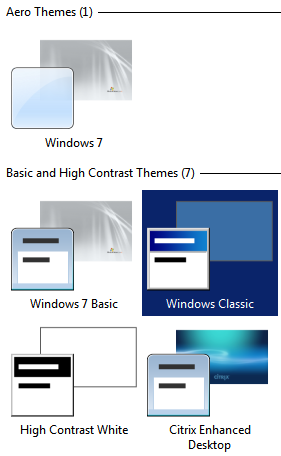 Likewise they now have the option to choose the other standard Windows 7 themes as seen in the first picture above. So nothing particulay difficult here but this gets the real Windows 7 Windows 7 themes into your XenApp enviornment not just the Windows 2008 Windows 7 theme! Your users shouldn't be unable to tell the differnece whether they are connecting to XenApp or XenDesktop.